There have been 60,000 confirmed cases of the flu since December, officials say. The deadly flu epidemic sweeping the nation has closed schools in states from Alabama to Texas and killed at least 30 children since its official start on Oct. 1, according to the Centers for Disease Control and Prevention (CDC). Every state except Hawaii is now reporting widespread flu activity, the CDC said. The outbreak has left parents wondering what they can do to protect their families against the flu and what to do once their child is diagnosed. 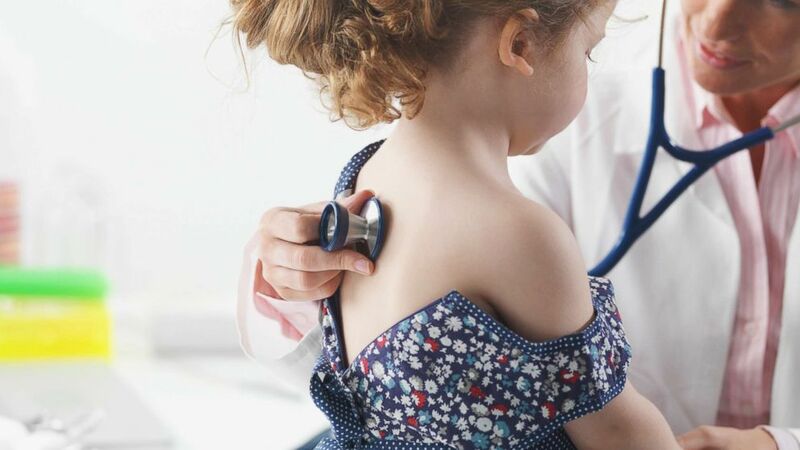 (STOCK PHOTO/Getty Images) Doctor giving a child a checkup in an undated stock photo. ABC News spoke to pediatricians across the country to find out what they want parents to know about the flu epidemic. We also had the doctors answer questions from ABC News’ viewers about the flu. Here is the information pediatricians want parents to know about this flu season. 1.The flu shot really works. Each doctor ABC News spoke with said getting your child a flu shot is the number one way to make sure your child is safe from the flu. This year's influenza vaccine is not as effective as officials would like for influenza H3N2, the most common strain in this cycle, but doctors say it will still ease your child's symptoms if not prevent them entirely. "If you’re talking about protection and issues about how you try to keep your loved ones as healthy as possible, the number one is still getting the flu vaccine," said Dr. Randy Bergen, a pediatrician and the clinical lead of Kaiser Permanente Northern California’s Flu Vaccine Program. "Some protection is better than no protection." It's also not too late to get a flu shot for your child if they have not yet received one, experts say. (Ted S. Warren/AP) Matilde Gonzalez, left, and Cesar Calles, hold their son, Cesar Julian Calles, 10-months old, as Ana Martinez, a medical assistant at the Sea Mar Community Health Center, gives him a flu shot, Jan. 11, 2018, in Seattle. "The flu shot cannot make a child sick," said Dr. Don Schaffer, managing partner of Pediatrics of Greater Houston. "There’s no reason to not give it and give your child every advantage they can." 2. You know your child better than anyone else. Dr. Joshua Schaffzin, pediatric infectious diseases physician and director of infection, prevention and control at Cincinnati Children’s Hospital, said parents should listen to their gut instincts if their child becomes ill.
"Classic flu feels like you’ve been hit by a truck because it's abrupt onset, high fever, cough, sore throat and all over body aches," he said. "It’s very striking for parents because their kid is running around and all of a sudden they don’t want to get out of bed." He added, "If a child comes home with a fever and isn’t feeling well, it’s not necessarily a time to panic. You do what you normally do. Parents take great care of their kids and [pediatricians] trust in that ability and knowledge and your keen sense of what’s normal and not. If parents have a gut sense that something is not quite right, it is perfectly reasonable to call your doctor. If the parents feel comfortable managing it at home, then that’s great." 3. Your child's illness may not be the flu. The flu season overlaps with seasons for other illnesses -- from RSV to the common cold -- that could also infect children, the doctors said. 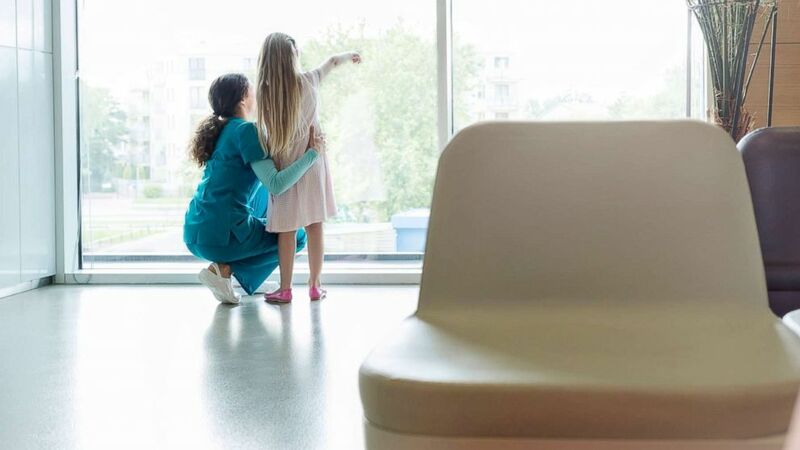 (STOCK PHOTO/Getty Images) A nurse looks on as a girl points out of a waiting room window in this undated file photo. "In pediatrics there tends to be a little bit of a difference in that very young children are more frequently affected by another respiratory virus called RSV," Bergen said. "We’re seeing the flu peak right now –- cough, cold, high fevers, body aches and pains and children tend to have more stomach-related issues with influenza -- but we haven’t seen quite the peak of RSV season." Doctors advised parents to stay alert and treat their child as needed, but not to panic that the first sign of illness means their child has the flu. 4.It's important to take care of yourself. "If you’re a parent you still have to care for your child," said Bergen, who advises parents to be proactive about washing their hands and staying away from sick people to avoid getting sick themselves. (STOCK PHOTO/Getty Images) A woman washes her hands in this undated stock photo. Good hygiene -- using soap and water, cleaning toys, using hand sanitizer and alcohol wipes on grocery carts and gym machines -- was also recommended for parents by Schaffzin. If a parent does become sick, the best approach is to stay home and quarantine yourself as much as possible from family members. "The earlier you are in the illness, the more contagious you are in general," said Bergen. "The critical thing is the fever. Most doctors will say if you’ve been without a fever for 24 hours you’re safe to return [to work or school]." 5. Your pediatrician is ready to make a plan. Schaffzin recommends making a plan with your child's pediatrician now, and again before the start of flu season next year, for what to do if your child becomes ill. This is critically important, according to Schaffzin, for parents of children who are higher risk for complications due to flu, including kids younger than two, or with congenital heart issues or lung issues. "Treatment is most effective when started early," he said. "So it's good to have a conversation beforehand, 'If the child becomes ill, what should our plan be?'" For instance, if your child has a pre-existing medical condition, such as asthma, a pediatrician would likely want to administer Tamiflu, an antiviral medication, right away. Medication could help prevent other complications, like pneumonia, from occurring and could help shorten the duration of the flu. "It works best if you start it as early as possible, at the first sign of symptoms," Schaffzin said. Not everyone, though, needs Tamiflu to recover. In some kids, Tamiflu can cause vomiting and dehydration so knowing ahead of time what your doctor advises for your individual child can help. 6. The emergency room is just for emergencies. 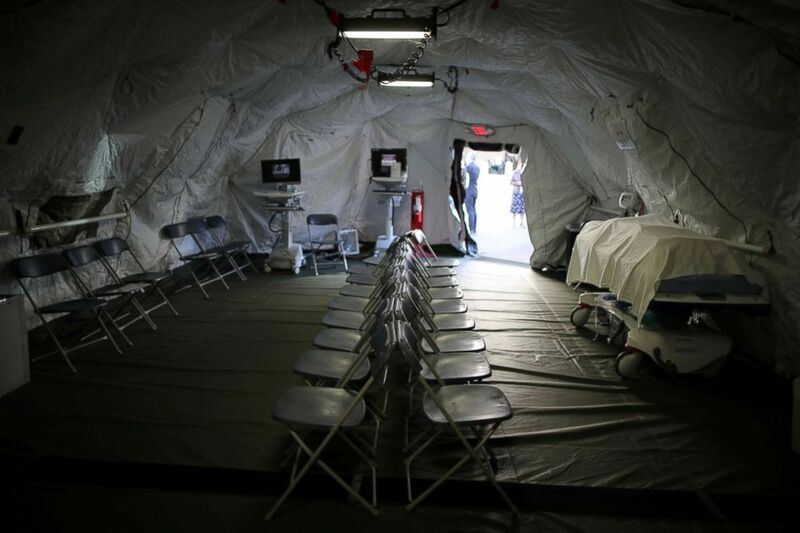 (Lucy Nicholson/Reuters) A triage surge tent is seen outside Loma Linda University Health Center for patients infected with an influenza A strain known as H3N2, in Loma Linda, Calif., Jan. 17, 2018. "I don’t like anyone to go to an emergency room unless it’s an emergency," Schaffer said. "If you’re having trouble breathing or persistent vomiting, you need to go the emergency room. If you just have a fever, you can come in the next morning." Schaffzin pointed out specific behaviors parents should look for in their child when deciding whether to go to the emergency room or to a doctor's office. "If your kid is not getting better and getting dehydrated, not peeing much, feeling listless, then it's reasonable to go to the ER," he said. "If your child is having difficulty breathing or their lips are turning blue, it's an indication of not getting enough oxygen so that would be a trip." He added, "Also check their hands and feet and see how pink they are. If the hands and feet feel cold, then you would consider going to the emergency room because it could be a sign the heart is not getting oxygen efficiently everywhere." For the "vast majority" of kids, according to Schaffzin, flu symptoms can be controlled with fluids, rest and controlling the fever and body aches with over-the-counter medications. 7. Stories of flu deaths are tragic, but not common. This month alone, news reports have spotlighted a 10-year-old Connecticut boy who died after being treated for flu symptoms while he was at a hockey tournament and a third-grade Alabama girl who died after her parents took her to the hospital with flu symptoms and fever. Schaffzin called the stories "terrifying" but not a reason for parents to be overcome with concern. "What they are is they’re extremely uncommon but that doesn’t make them any less tragic," he said. "Every year, a number of children die of the flu and that’s why it’s a potentially very serious infection and something to have a conversation with your doctor about." Schaffzin added, "For the most part, knowing what you know about your kid, keeping your eye open for things that don’t seem right and having a conversation with your pediatrician will keep you ready if something happens." We are hearing a lot about sepsis being the reason people are dying from the flu. How do we ensure sepsis is diagnosed & treated if a child contracts the flu? Sepsis is a potentially life threatening response that your body mounts in the face of a threat, most commonly to an infection such as pneumonia, according to Dr. Catherine Spaulding, a pediatrician and resident in ABC News' medical unit. "Depending on your child’s age, sepsis will likely present with several different signs including high fever, poor appetite, fewer wet diapers, pale hands and feet, rapid and shallow breathing or listlessness," Spaulding said. "Since sepsis can be life-threatening, you should make an appointment to see your doctor or go to the ER if your child has any of these findings." She added, "It is very rare for the flu to lead to sepsis. However, should it occur, your doctor will recognize the symptoms and ensure your child is correctly treated. Treatment for sepsis depends on the underlying cause, but is primarily focused on administration of large amounts of intravenous fluids and antibiotics." "Usually within 48 hours you should see the kid is either not getting any worse or starting to get better," said Schaffzin. "Symptoms past 48 hours doesn’t mean that there are strong concerns but that it's a time to think, 'Should I reach out? Do I need something else?'"